Tofu: do you love it or hate it? I’m definitely a lover. 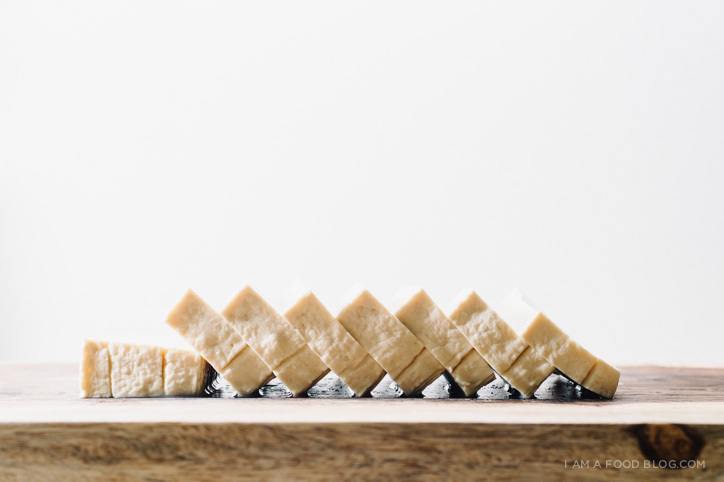 Sometimes, when I’m prepping up a block, I’ll sneak a bite or two, of cold, unadorned tofu. I’m probably one of the few people in the world who likes to do that, but there’s just something about tofu in it’s pure state that is so incredibly satisfying to me. Soft/silken tofu, block tofu, egg tofu, tofu puffs, dry tofu, there are so many types of tofu in the world and I love them all! If you aren’t a fan of tofu, it’s probably because you haven’t had it prepared correctly. For some reason, in North America tofu has this weird insecurity complex where it goes around pretending to be something else. Oh Tofu, what are you thinking? Obvs if you go around pretending to be turkey someone’s going to realize you’re not the real thing and call you out on it! If you just come to the plate as tofu, everyone’s going to LOVE you. Sure, it sounds like I’m giving tofu some cheesy self-help, love yourself just the way you are advice, but the thing is: it’s true. When you pretend to be something you aren’t, you end up feeling guilty or inadequate. Do the people love the real tofu or do they just love tofu dressed up as turkey? If only you let your real soy bean self shine through. I can pretty much guarantee that someone will end up loving you as you, quirks and all. 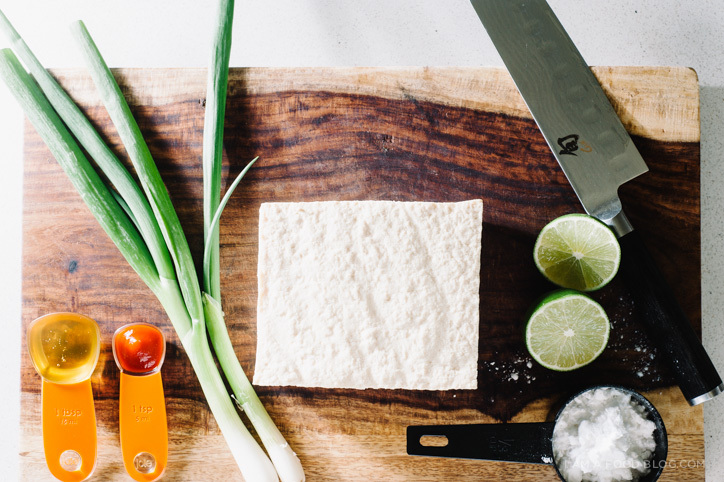 Seriously though, tofu is one of the most versatile ingredients out there. I don’t have many tofu recipes on the blog because it’s just a part of my life. Tofu should be part of your life too! If you’ve never tried tofu or you want to give tofu another chance, this is the recipe for you. Crispy and crunch on the outside, creamy and smooth on the inside, with a delectable sriracha honey lime sauce (same as the sauce I put on chicken), this tofu is a winner, no pretending needed. Drain your tofu and cut it into 8 even pieces. Place a couple of paper towels down on a plate or cutting board and lay out your tofu. Place a couple of paper towels on top. They idea is that you’re drying it out slightly – you’re not pressing it, just removing some excess moisture. Pressing removes most of the moisture from tofu, which is NOT what we want here. Leave it a bit moist, this ensures a soft and creamy tofu interior that will contrast with the crunchy potato starch coating. 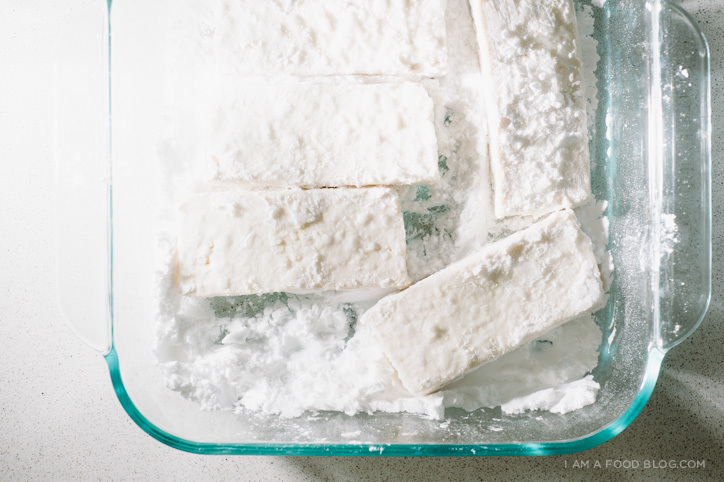 Spread your potato starch out in a shallow dish and coat each piece of tofu, ensuring that there are no bare spots. In a cast iron pan, heat up a bit of oil over medium high heat. You don’t need a bunch of oil here, just maybe about 1 1/2 to 2 tablespoons. 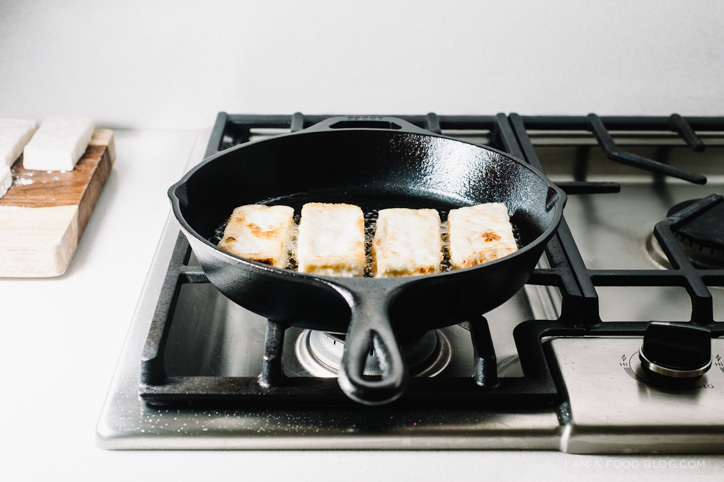 When the oil is hot and shimmery (you can test it with an uncoated wooden chopstick – when the oil is hot bubbles will form around the chopstick), add the coated pieces of tofu and cook until golden brown and crispy. Time wise, this can vary, but tofu is quite forgiving as it doesn’t brown easily. When one side is brown, flip it over and repeat. Rest tofu on a wire rack (this ensures crispiness) while you make your sauce. In a small sauce pan, heat up the sriracha, honey and lime juice over medium high heat until slightly reduced and glossy. Drizzle over the tofu pieces and top with sliced green onions. Enjoy immediately! Notes: A lot of tofu recipes call for marination, but I prefer to cook my tofu plain and add sauce later. That way the flavour of the tofu (and yes, tofu has a flavour) isn’t marred. The tofu I used for this is block tofu, not silken. You can find potato starch in most Asian grocery stores. 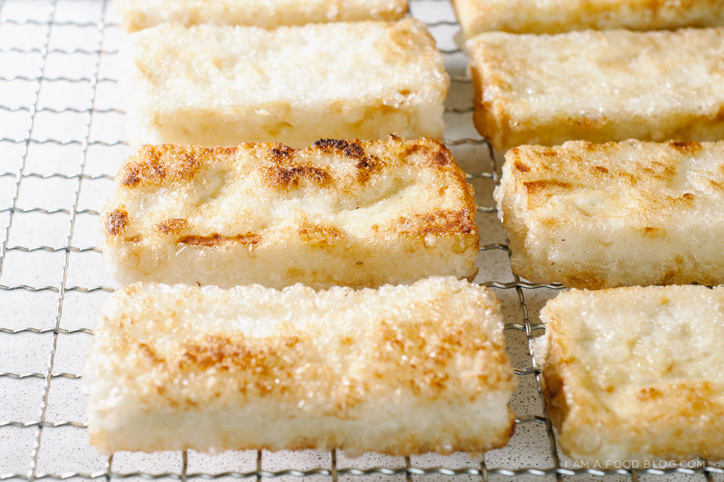 Potato starch has a bubbly, extra crunchy texture when deep-fried. You can substitute cornstarch, but it won’t have the same crunch factor. Love tofu? Check out my Mapo Tofu Waffle Recipe! OH HELL YES. I love crispy tofu! And with honey sriracha sauce? I die. 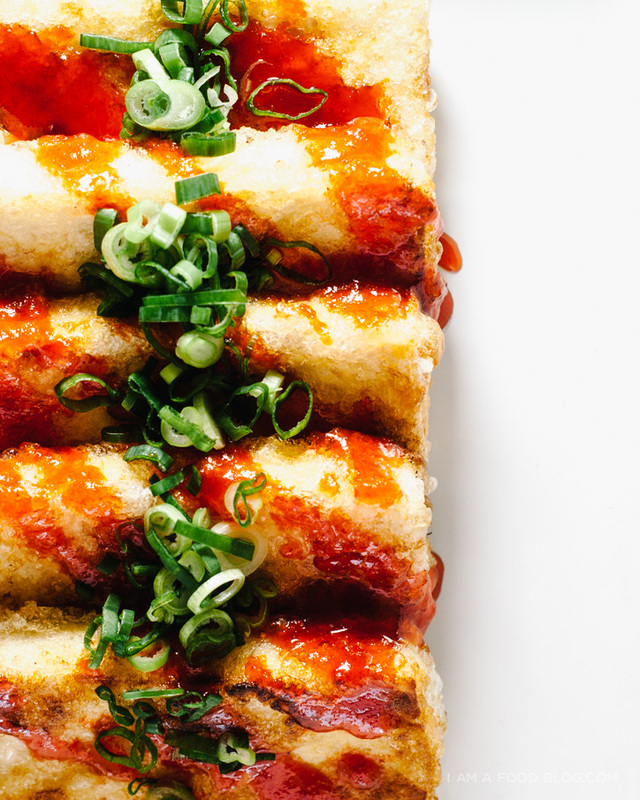 Crispy tofu is a welcomed veggie option any day. I even like it more than meat (sometimes), Pairing it with that sauce? Please cook for me! I am digging this tofu sooooo hard!! It looks awesome! I live in Switzerland and I think I can only get silken tofu…Will that do? Would really love to make this dish! Thanks Sarah. I live in Lausanne and those tofu from Coop are really not nice. I have tried them before. But thanks for sharing, I will look out for the Asia supermarket when i’m in Zurich! You can definitely use silken tofu – just get the firm kind! Yes! I thought I hated tofu until I tried some that Cynthia from Two Red Bowls made. I think you’re right about Americans always trying to pretend that tofu is something else … we need to be schooled a bit better on this food. Thanks for sharing! I love tofu!! I think it gets a bad rep. I haven’t tried to make it at home though, so I will have to give this a go! I have gotten my husband to eat it when we order take out, so that is a step in the right direction! We’ve been in a tofu rut for the last several months and this might just be the answer to our tofu dreams :) How delicious! Americans don’t dig Spam and they don’t dig tofu either. They missin out. I’m so thrilled that you posted this! Facing a July 4th cookout as a new vegetarian, I was trying to think of what to throw on the grill and thought that if I brought chicken for my husband and tofu for me, we could use your honey-sriracha glaze for both! THIS all crispy-fried and puffy and tender inside sounds even better! Woweeee YUM! Thanks for the good info here on tofu. Have you ever tried making your own? We have Andrea Nguyen’s book but we haven’t tried the process yet! It took me a long time to come around to tofu — it was only when I had it lightly battered and fried that I realized how awesome it could be. This recipe looks BALLER, btw. I’m a lover, this recipe is is simple and awesome, that sriracha honey lime sauce looks killer! I’m one of those that love tofu. I love tofu puffs in curry noodles because it absorbs all the curry like a sponge and then releases it when you bite down. That moment is magical! I love fried silken tofu on a hotplate in brown sauce, crispy fried tofu in just about any sauce. But my favorite is my butter sauce with curry leaves. Never eaten it raw though! Loving the recipe. Could you do this with corn starch as well or does the potato starch fry up nicer? I laughed at your tofu with insecurity complex comment haha, tofu needs to stop impersonating other foods and just be tofu! I definitely think potato starch gives it more of a heartier crunch whereas cornstarch is more delicate. Both are tasty though! I really don’t like cotton tofu, but I love silken tofu cooked in any sort of Japanese way. I have been thinking of giving tofu another chance by cooking it this way (after seeing the flour+ fry method from Harumi Kurihara) but this sauce looks killer! I can’t chug down sriracha unfortunately, I am a wimp…is there any other thing I could use instead? breakfast! May I suggest you instead use sweet and hot chili sauce? Trader Joe’s is good;sweeter than Mae Pong brand;which is hot, but not too hot. just stopping by to say. tofu is awesome. more tofu recipes!! So crispy and spicy and delightful! NOM NOM NOM. can I bathe in that sauce please???? I sneak bites of plain, uncooked tofu when I’m cutting it up too! I think it’s just habit to do with whatever I am cutting up… but sneaks or no sneaks this tofu looks GOOD. I love that you value the flavor of the tofu! Too often I feel like people try to add so many spices/salt/etc. that the delicate flavor gets lost in the process. Beautiful photos too! YES. YES. You knew I was lusting after that flavor combo on that chicken and you answered my prayers!!! Looks SO GOOD. I totally sneak bites of raw tofu. It’s especially satisfying when I’m really hungry and feeling protein-deprived. Omgg now I’m thinking about all the delicious tofu dishes that I had at dim sum a few weeks ago…shrimp-stuffed, those slabs of silken tofu that are lightly fried and oh so crispy…UGH YUM. Also: “If only you let your real soy bean self shine through. I can pretty much guarantee that someone will end up loving you as you, quirks and all.” <– I LOVE THIS. Girlfriend. 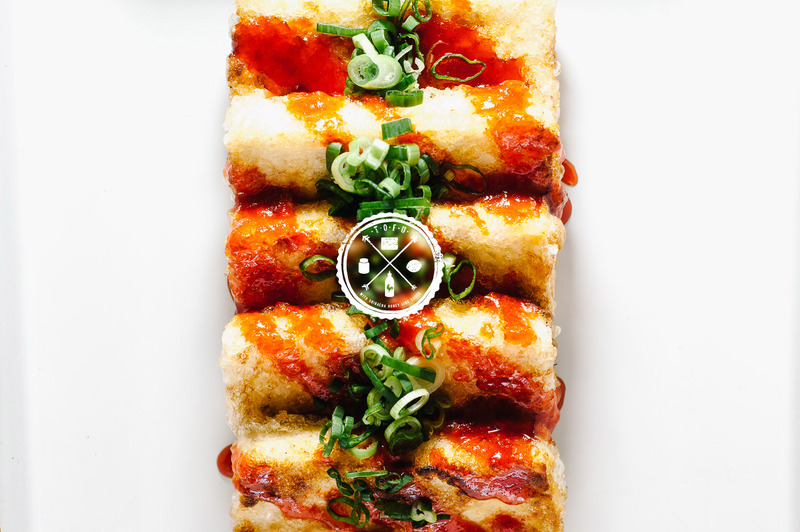 I LOVE tofu, and this looks amazing. I also am one of the eat-it-raw people. In fact, I have a few raw cubes on my salad right now! Made this recipe last night.. Amazing. The potato starch was key for giving the tofu the crispiness I’ve been looking for. I just started writing my own blog and you’re on my reading list. You inspired me so much.. Thanks for such a great recipes. 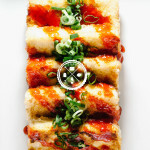 And I love tofu and the way you make it with Sriracha sauce is just marvelous. Oh goddd this looks amazing. So agree with tofu being a very underrated and misunderstood ingredient. The stuff’s awesomeee! Yum, looks delicious! More of these tofu recipes you mention please! I love tofu, but I’m always looking for a new delicious way to eat it! Wow! Tofu is out of this world no matter how it is prepared. My son grew up around Chinese Cuisine and has always loved tofu since he was about 3 years old. Do you have any delectible squid recipes? Also can I substitute Panko for potato starch? Obsessed with this recipe Steph. Made it a few times already. Used corn starch first, and then found potato starch. Definitely noticed the difference in a crunch. So simple & delish. This recipe was amazinggg! Using the potato starch instead of corn starch gave the tofu noticeably more crunch. I added about 1/2 a tablespoon more honey to the Sriracha sauce because I found it quite spicy when I tried it from the pot, but then it was perfect for me! Limey sweet at first and then amazing heat. Loving your blog! I made this for dinner tonight. I LOVED IT! Added this to my bookmark to make for dinner! I have been cooking tofu for decades now and would recommend not to substitute anything for the potato starch! Had a tough time finding some, but the tofu turned out better with potato starch than with anything I have ever used! Waaaay better than corn starch. I LOVE this so so so so much. About to cook up a pot of rice and have this for lunch!! (With firm tofu though, sorry–don’t hate me!!) I have never thought to fry it up with a potato starch coating but all I can think right now, is DUH. Why not! Genius! How is this next day for lunches? hey jacob, i haven’t tried it the next day. it might loose some of it’s crunchiness, which is the nature of fried things. if you give it a go, definitely keep the sauce separate and reheat in an oven or toast. hope that helps!